Parents make mistakes. It’s just that simple. There is no book of answers to questions we have on raising our children, but because we are human, we do have bad days, and yes, we do make mistakes. This doesn’t mean we can’t admit that we were wrong, be willing to grow from the mistake, and do better next time. 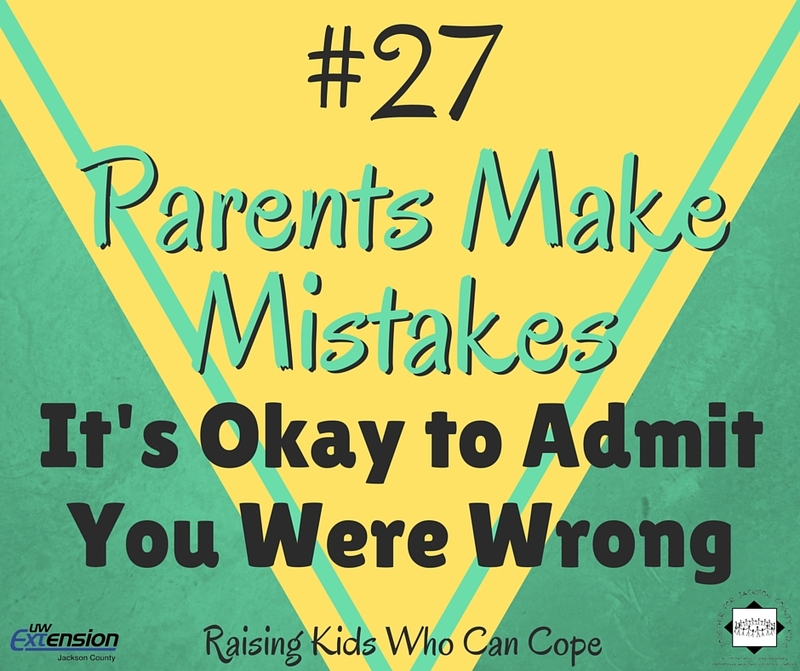 Admitting you were wrong, and apologizing for your actions, will not undermine your authority with your child. In fact, apologies can help build a stronger relationship between parents and children. Apologies help restore good feelings, reduce the resentment your child may feel, and give you a chance to talk to your child about what happened and why it was wrong. They also teach the child that everyone makes mistakes and how one should behave when they do. Mistakes teach us lessons and remind us that we are human. Instead of dwelling on a mistake you may have made, you need to push forward and keep trying. From mistakes we also learn to problem solve and be a better person. Life is a journey and so is parenting. As we make mistakes, we become better, wiser and respected by our children for admitting that we did. Children do not need perfect parents, they need us to model for them how to be gracious humans. It is never too late to recognize mistakes and apologize for your actions. This can transform your relationship with your child into one with much trust and respect. As parents, we need to stop being so tough on ourselves for not being the perfect parent (whatever that is). We need to remember that life happens, and so do mistakes. Grocott, Heather (2014). Parents make mistakes, too. WPRI.com program, aired: April 14, 2014, 11:06 am. This entry was posted in Raising Kids Who Can Cope and tagged communication, coping skills, youth. Bookmark the permalink.